What a year it has been in the world of table tennis! 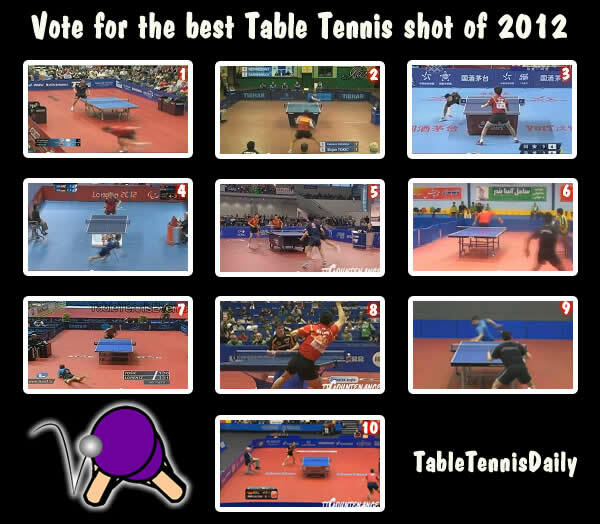 Over the last few weeks TableTennisDaily members have been submitting their favorite shots of the year (2012) to us. Below is a video compilation (XMAS Edition) of the Top Ten best shots voted by you guys. 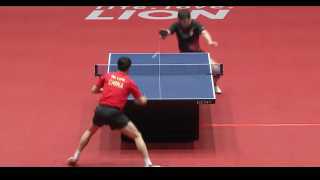 Last year, this Christmas compilation went viral to 1.7 million viewers around the world, lets see if we can get these epic table tennis athletes viral again by liking and sharing this page! Now we can narrow down to the ultimate best shot of 2012. Which player hit the best shot? Voting poll ends on 31/12/2012 at 23:59 GMT. Take part today! Watch the video then vote in the TTD poll above. Merry Christmas everyone and have a fantastic new year on behalf of the TableTennisDaily Staff and Members! So many epic points, who did you vote for? Wertherills shot is the hardest one i think.. I think the shot of the year has to be Dave Wetherill Team GB at the London 2012 Paralympics, the moment it went onto youtube it went viral (probably seen in outer space by now ha ha) and millions have seen it. That determination showed passion, heart, skill and a bit of crazy thrown in which is what we all love about the sport. The looks on everyone's faces it just says it all. Amazing!! Wetherill's point for me is the best! However I also love Amin Tayan (No look back shot)! Very nice said! Unfortunately i don't even know who won the match finally? But when I have to look at this poll as of a SHOT of the year, well.. Okay, the paralympic shot is amazing, but I dont think it deserves a title of a shot of the year. We have seen shots like that before (at least I did).. I also saw excellent touch rolling balls after net.. I also saw many around the net shots.. I also saw some behind the back shots.. But what I have never seen is what mr. Amin Tayan did!!! Because I had to rewind it and watch it like 4 times again and again till I really understood what happened there! That was like completely insane! I believe that he couldnt repeat that one if he tryed hundred times, hehe.. But this was simply.. for me.. THE SHOT OF THE YEAR! All these 'best shots' were magnificent, but quite similar, but Wetherill's shot stood out the most in my opinion! Voted for number 4! "The more you sweat in training, the less disappointment there is in the games"
Οh my god a lot of amazing points !! I will go with Kreanga's power and the best backhand in the world Epic rally !! It' s all about Concentration!!!! I think, GBR Vs GER (2) has to be the best shot of 2012. I think Wetherill's shot has to be the best, it's inspirational, it's amazing and he took the fall to win the point. Everyone else loved it too, well worth a standing ovation. i will go for wetherill, not because of the amazing shot but the effort he puts on just to get and return the ball. i definitely think that the determination and such amazing effort is what makes the shot incredible, not just the shot itself. Hi guys, cheers for the votes of confidence! I haven't done many posts on here but that doesn't mean I'm not well aware of how phenomenal this site is, great stuff! I'm not gonna say who I voted for but what I will say is that I'm honoured to be included in this poll, such a privilege! Its the stuff of dreams as a table tennis fan growing up. Dunno whether I can honestly say I think my shot is the best, or whether it even deserves to be there at all...I'm sure you've all done plenty more amazing shots in your time (as have I)! These just happen to have been lucky enough to be caught on camera They're all incredible!! Also, cheers for spelling my name wrong in the poll!